Slots Million Casino is one of our top recommended online casino websites for players from Australia, Canada, New Zealand and many more countries around the world. Starting life as a slots specialist site, Slots Million now hosts over 1,900 real money slots and table games from 42 casino gaming software providers, ranging from big names like BetSoft, Microgaming, and Net Entertainment to niche studios like Genesis, Rabcat and Yggdrasil. With the largest and most diverse range of games available along with some generous promo codes and bonuses, it’s easily one of the best casino sites on the market at the moment. This page will list current and exclusive promo codes you can use for big rewards. All readers of OnlineCasinoWebsites.com can redeem the following exclusive promo codes and bonuses for Slots Million Casino’s (read the full site review) latest player promotions. 1. Multiply x2 your first deposit + 20 free spins: All new players who sign up to SlotsMillion.com via our included links can claim up to $100 in matched deposits and 100 free spins to use on selected slot games. To claim your welcome bonus, make your first real money deposit and Slots Million will match it by 100% up to $100, which means the maximum you can deposit is $100 and gain in matched credits is $100. Slots Million will also award your account with 20 free spins to use on one of NetEnt’s most popular slot games and 20 additional free spins over the following four days. Currently, no coupon code is required to redeem this bonus. 2. Gentleman’s Night and Ladies Night: Both guys and gals can score 40% extra in matched deposits up to a maximum of $100 every time you deposit into your Slots Million account between 7pm and 11pm on Mondays (Ladies) and Wednesdays (Gentlemen) in your local time-zone. How do I deposit and claim promo bonuses at Slots Million? 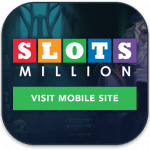 To claim this exclusive sign up bonus, click (or tap, if on mobile) the ‘Visit Mobile Site’ button or the ‘Sign up at Slots Million’ button located on this page or any of the other included Slots Million links to claim your exclusive welcome bonus offer in full. Follow the prompts to create your account by providing basic contact information – make sure to use your real details if you want to successfully withdraw any potential winnings, as you need to provide proper documentation whenever funds or bonuses are involved. All options process deposits and withdrawals instantaneously except for wire transfers, which take three to five working days – make sure to take this into account prior to redeeming your bonuses. General: All bonuses can only be redeemed once. The minimum deposit amount to qualify for the bonus is $20/€20/200 kr and the maximum bonus amount that can awarded to your account is $100, converted into your local currency. The maximum bonus bet that can be placed on games is $5 or $0.50 per bet line. For the free spins, they can only be used on the following games: Gonzo’s Quest, Fruit Shop, Twin Spin, Jack & the Beanstalk and Spinata Grande. Expiry: You must use all bonus money and free spins within 7 days. Any unused bonus will expire and be removed from your account after this time-frame. Accepted countries eligible for bonuses: Anland Island, Australia, Finland, Germany, Iceland, Ireland, Luxembourg, Netherlands, New Zealand, South Africa, Sweden, Switzerland. Exclusions: Anguilla, Belgium, Bermuda, British Indian Ocean Territory, British Virgin Islands, Cayman Islands, Cyprus, Denmark, Falkland Islands, France, French Guiana, French Polynesia, French Southern Territories, Georgia, Gibraltar, Guadeloupe, Guam, Guernsey, Hungary, Isle of Man, Israel, Italy, Jersey, Martinique, Mayotte, Montserrat, New Caledonia, Northern Mariana Islands, Pitcairn Islands, Russia, Réunion, Saint Barthéley, Saint Helena, Saint Martin, Saint Pierre and Miquelon, South Georgia and the South Sandwich Islands, Spain, Turks and Caicos Islands, U.S. Minor Outlying Islands, U.S. Virgin Islands, United Kingdom, United States, Vanuatu, Wallis and Futuna. Wagering Requirements: All potential winnings from your sign up bonuses are subject to playthrough requirements and must be turned over at least thirty-five times (35x), before you can withdraw. Visit the Slots Million Casino website for detailed playthrough game contribution charts. General: All bonuses can only be redeemed within 7pm – 11pm on the specified day of the promotion (Monday for female players, Wednesdays for male players). The minimum deposit amount to qualify for the bonus is $25/€25/250 kr and the maximum bonus amount that can awarded to your account is $100, converted into your local currency. The bonus is only available to players who have deposited at least once before. Expiry: You must use all bonus money within 7 days. Any unused bonus will expire and be removed from your account after this time-frame. Wagering Requirements: All potential winnings from your sign up bonuses are subject to playthrough requirements and must be turned over at least thirty-five times (35x), before you can withdraw. Customer support at Slots Million Casino is prompt and easy to get a hold of. Click (or tap, if on mobile) the ‘Help’ button on the side of every page or the ‘Contact Us’ link at the bottom of their homepage and you will be presented with three options – email, live chat, and phone. Generally, we encountered no problems redeeming their bonuses with our accounts, but if you have any difficulties, queries or concerns, don’t hesitate to contact their customer support for more information, as we found them to offer one of the most helpful online casino support services out there.